It’s an insane time for set designers. Rocky made the Winter Garden into an action-packed stadium arena, Bullets Over Broadway had a revolving stage within a stage, Act One constructed a spinning home. Sets have become grander, bigger, realer, and more detailed. You Can’t Take It With You goes big and goes home with its enormous, all-encompassing Vanderhof house, lined with knick-knacks, frames, and eye-catching curiosities. It’s the perfect setting for the happily eccentric Vanderhof-Sycamore family. 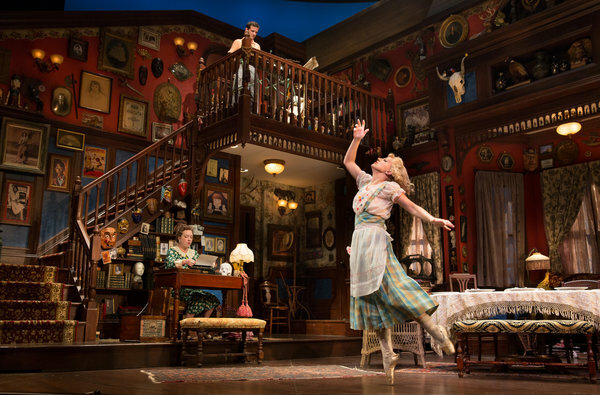 Its complexity and detail keeps the audience wondering and gazing throughout the play’s three acts, all of which take place right in the family’s home. Also, there are fireworks. Several times. And kittens. Definitely not enough kittens. The man is a film and theatre legend. At 83, he still possesses a youthfulness and vigor that energizes his performance. Jones is perfect for the role– the whimsical, wise, and frank Vanderhof patriarch who takes joy in life’s small wonders and people’s individuality. He takes it on with a playful, confident acuity, and by the end, we are more than ready to join the dark side with him. Sir, we are not worthy. 3)…and the rest of that cast! Kaufman & Hart won the 1937 Pulitzer for Drama with YCTIWY, and the film adaptation (an early Frank Capra-Jimmy Stewart collaboration) won the Best Picture Oscar in 1938. It’s remarkable to see how many of the same conversations from nearly 80 years ago are still relevant to our present cultural climate. Conversations like the role of government and taxes in our freedoms, the stifling of passion and creativity in a work-minded people, the overwhelming influence of having/not having money, and so much more. The play leaves you with a sense of perspective in a way that few other comedies, or even tragedies, do. It’s refreshing to walk out of a theater clear-minded, focused, and happy.